In 1979 Dr David Flood, Cathedral Organist and Master of Choristers, was the first person to place his hands on the Cathedral’s newly refurbished and restored Willis organ. 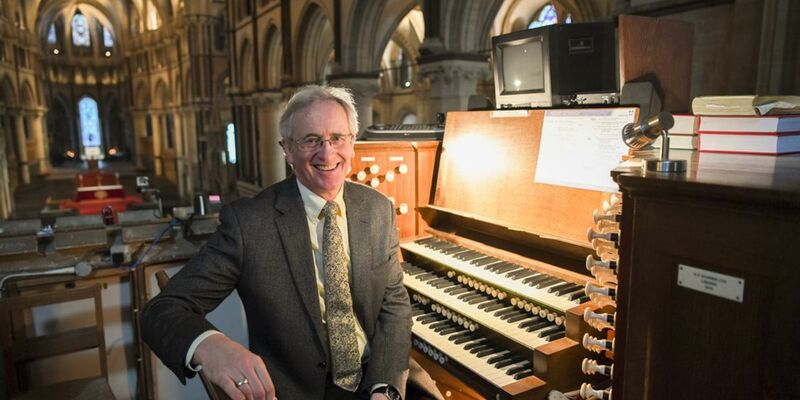 Some 39 years later, Dr Flood has played the organ for the last time before it is dismantled and upgraded as part of a £4.2million organ restoration project. Dr Flood said “The organ has served the Cathedral well over the years. It is the same organ that I had the pleasure to perform on for the historic visit of Pope John Paul II in 1982 and also featured at the Enthronements of four Archbishops. “The time has come however for the organ to be given a new lease of life. Not only will the organ be expanded to almost twice its current size, incorporating new sounds and timbres, but the organ console will also be relocated from its current position in the organ loft to a new location alongside the Quire. All of the existing organ pipes will be reused in the refurbishment including the original 17th century pipes built by Samuel Green, which have been at the heart of the Cathedral’s organ since its initial installation. The project will be funded by The Canterbury Voice, an initiative set up by the Cathedral Trust to ensure the musical legacy of the Cathedral. Sarah Frankland, Chief Executive of the Canterbury Cathedral Trust, said “The Canterbury Voice is an ambitious fundraising project with many strands, but the refurbishment of the Cathedral’s great organ sits at the heart of it all. Thanks to the generosity of the Cathedral’s fantastic supporters, we have raised just over half of the £4.2m required for the conservation, repair and re-building of the organ and the fabric surrounding it, including the re-instatement of nearly one third of its pipes, that were removed in 1979. We are still working hard to raise the funds required for the completion of the refurbishment, in time for the organ to be played during the decennial Lambeth Conference in July 2020, when all of the world’s Anglican Bishops will congregate at Canterbury. For more information on this and the other strands of the Canterbury Voice click here or visit www.thecanterburyvoice.org. You can also support the organ project by texting: PIPE10 £10 to 70070 to donate £10. In the short film below you can hear Dr Flood as he plays the organ for the last time prior to it being switched off and dismantled.